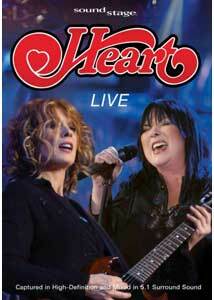 safe in the trees, you had tears on your face..."
As what was originally a two-part installment of the PBS music series Soundstage, this full concert disc from Heart's 2005 television performance runs nearly two hours, with a set list of 23 songs. The band�all built around the nucleus of sisters Ann and Nancy Wilson�has seen something of a DVD resurgence in the past few years, with this being their third concert release. It's been a long time since the debut of Dreamboat Annie in 1976, yet the Wilsons have managed to retain the necessary stamina and finesse to tour regularly, and still deliver the all the radio hits, new songs, and classic covers with a rockable level of consistency. Not surprisingly the set list here pulls seven tunes from 2004s Jupiter's Darling (current at the time of the performance), with the remainder being a mix of some of the bigger hits, along with the covers that have long been part of their live set. The dual acoustic guitar opener of Sand (a song I can find no information about) is a nicely done balance between the Wilson sisters, and it's a song that seems like it could have been lifted from the Dog & Butterfly era, with Ann earning a roar from the crowd over a particularly throaty growl during the chorus. The touring band (including Alice In Chains bassist Mike Inez) is then trotted out to kickstart a couple of the more up tempo hits (Kick It Out, Straight On), before it's back to just the Wilsons, as Nancy digs out a mandolin to take lead vocals on These Dreams. This serves as a neat dovetail into the first of three of Heart's standard issue/straight forward Led Zeppelin covers, in this case The Battle Of Evermore. Aside from the dips into the less well known Jupiter's Darling (and the aforementioned Sand), the remaining selections cover some of the bigger tunes of Heart's career, as reflected by the back-to-back-to-back of Crazy On You, Magic Man, and Bebe Le Strange. The covers continue with another Heart favorite (Elton John), here with an Ann and Nancy dual acoustic take on Love Song, and as expected the set closes with the other two Zep mainstays: Black Dog and Misty Mountain Hop. Ann Wilson once again proves herself more than up to challenge of taking on the distinctive vocal stylings of Robert Plant, and I'd wager that if you put Wilson and Plant together today that she would crush him when it comes to taking on these rock chestnuts. And that's not bitchslap to Plant, because for what it's worth I consider his 2007 Raising Sand release with Alison Kraus to be one of the finest discs of the last five years. It's just I think his Misty Mountain Hop days may be behind him. As is the Soundstage way, production values are impressive. Utilizing what seems like a million different cameras, there's rarely a static shot that lasts more than a few seconds, with visual coverage from the side, the front, the back, and everywhere in-between. The stage is adorned with a few too many video screens relegated to either showing the band's name or featuring some trippy color patterns, while the stage lighting is bright and colorful, and most importantly doesn't ditch the supporting band (Inez, Ben Foster, Debbie Shair, Craig Bartok) into the shadows. Image Transfer Review: Soundstage: Heart Live has been issued in 1.78:1 anamorphic widescreen. Concert discs can be a troublesome proposition, but there's not much to really nitpick about, as this one displays vividly bright colors and consistently natural fleshtones. Edges do come off a bit subdued at times�lacking a razor-sharpness�but the transfer does reveal other smaller details well, such as the fingerprints on Nancy Wilson's acoustic. Audio Transfer Review: Audio choices include 2.0 stereo and 5.1 surround. No surprise, but the winner here is the 5.1, a loud and clean blend in which the drums have an especially deep subwoofer presence. Voice and vocals are clear, as are the nuances of those acoustic guitar solos, with audience cues effectively relegated to rear channels, adding to the requisite live feel. A solid, impressive effort all the way around. Extras Review: This one comes with a slipcover over a clear plastic keepcase. The only extra is the brief Heart: Interview (08m:47s), in which Ann and Nancy politely discuss their fans and their music. The disc is cut into 23 chapters, one per tune. Heart�specifically Ann and Nancy Wilson�continue to show they can more than hold their own after a long, long rock career. This set dips seven songs deep into 2004s Jupiter's Darling (so there's a mix of relatively "new" material), as well as the expected classic hits (Barracuda, Straight On), along with the obligatory Zeppelin covers.